Halloween is just around the corner, and I’ve found that most of us DIY’ers are a creative bunch… Not decorating our porches and gardens for Halloween just seems wrong somehow… Few other times are we allowed to publicly let our imaginations go a little wild, and maybe even a little creepy… and yes, I’ll say it… a little sick. I sincerely believe Halloween is one of those times we can bring the fears of life that we live with every day down to size…to use the opportunity to make light of all the scary things out there in the world. Personally, I’m not into gross… creepy yes, but I’ll leave the gore to someone else. So here we go… our picks for DIY outdoor Halloween yard decorations… let’s have some fun! Can you imagine how creepy this Halloween ghost would be, with the right, barely there lighting? 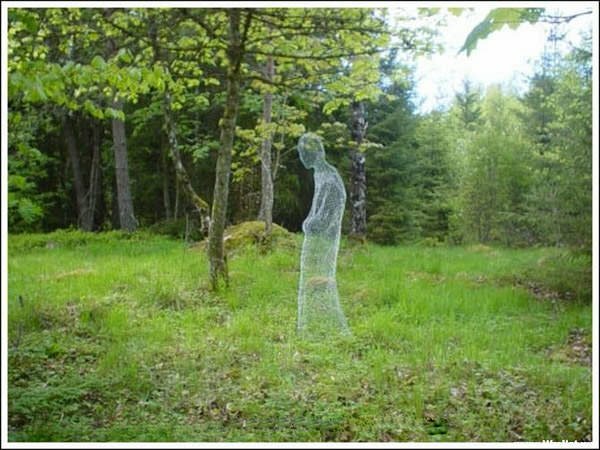 This project uses standard chicken wire, and you can follow the tutorial for shaping your fencing ghost, DIY. I have seen some blogs recommending spray painting with glow in the dark paint. I think that would be cool until the paint losses its glow, so maybe placing where it gets hit by car lights, or a porch light casts just enough glow? From ‘Wacky Archives‘. 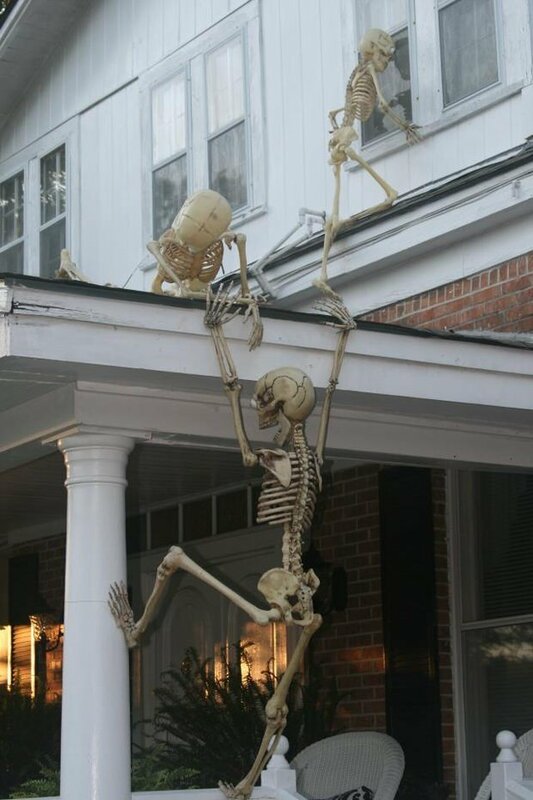 Tired of that old skeleton just hanging on the porch, blowing in the wind? 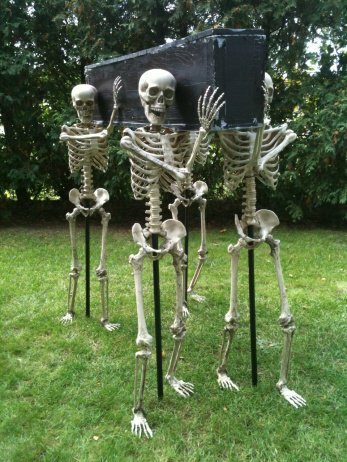 Gotta love these creative Halloween yard decorations… This one you can find instructions for at ‘Instructables‘. This one is way cool! Instructions at Halloween Forum. 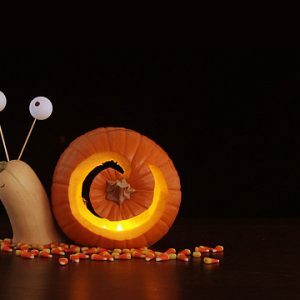 Ok, this is just cute… and a little creepy, especially if done with a really large pumpkin! 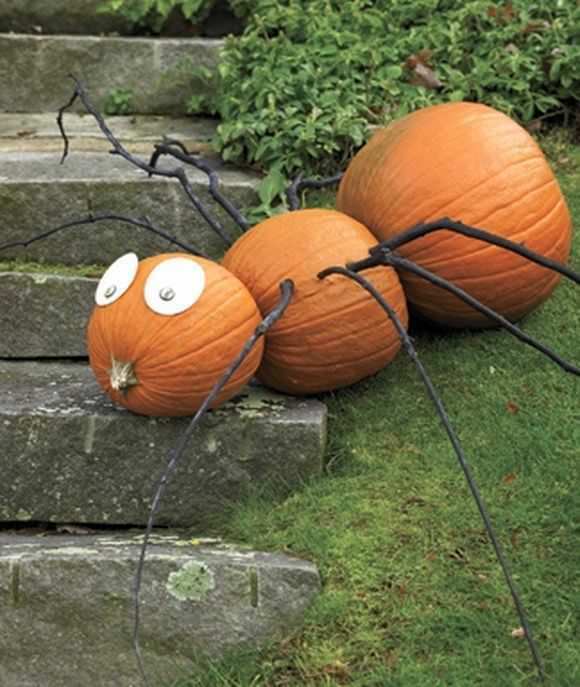 Check out how to make a pumpkin spider from ‘Budget Wise Home‘. 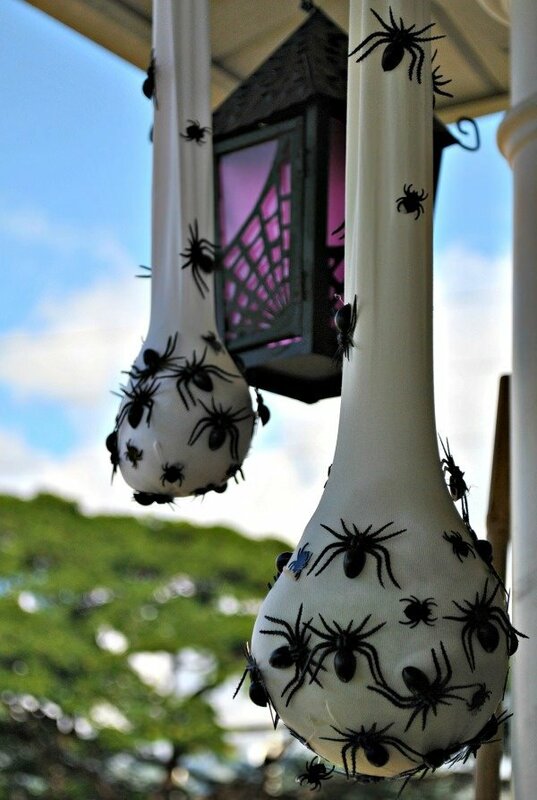 These spider sacks are easy, cheap and creepy… what if you used semi sheer stockings to give them a more ethereal quality? Here’s the instructions for these DIY outdoor Halloween decorations from ‘Hello Paper Moon‘. 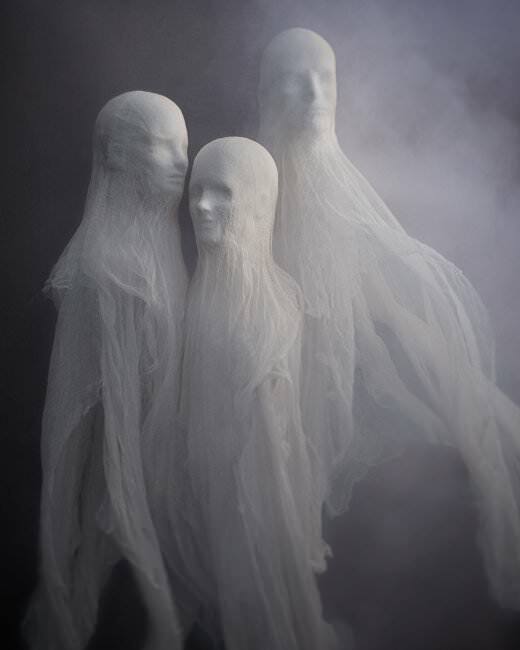 Finally, want your Halloween ghosts to look a little more…um, realistic? Check out these easy versions from ‘Martha‘! 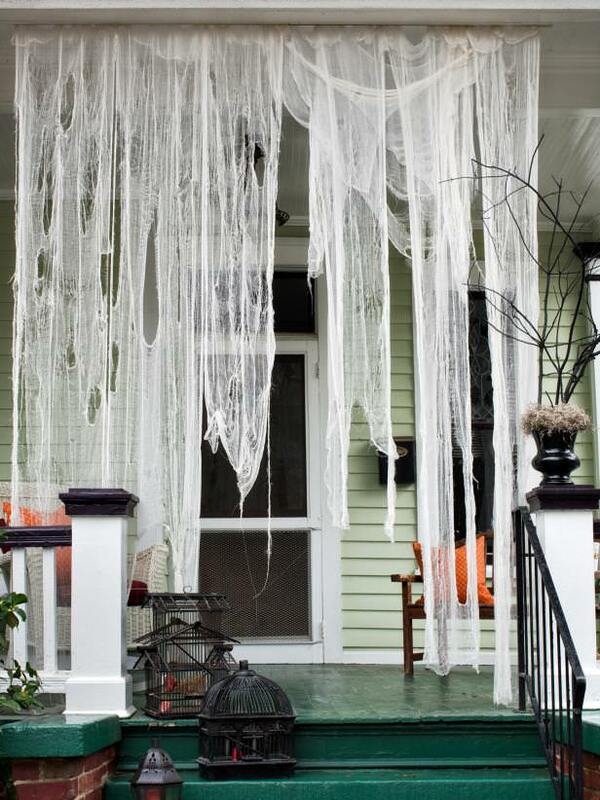 Make easy DIY creepy Halloween curtains for your front porch. These are a great way to make your whole Halloween decorating scheme more focused. Let’s people see that your front porch is decorated, but hides just enough to make it all a little bit of a surprise. (Or shock, depending on how scary you decorate for Halloween!) Tutorial from ‘HGTV‘. 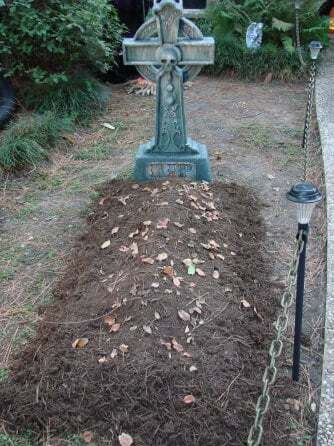 Want a fresh grave for your Halloween graveyard, but don’t want to dump dirt on the lawn? Check out this easy trick from ‘Aidtopia‘. Photo from ‘Halloween Forum‘. Whatever you choose to do for your outdoor Halloween yard decorations, make sure they are creative and fun! Which are your fav’s, and if you know of others great tutorials, please share in our comments! We think you will also love our posts on DIY Outdoor Halloween Decorating Ideas and Fall Front Porch & Outdoor Decorating. ← 16 Cool Pumpkin Carving Ideas You Never Thought Of! Hi, I was just wanting you to know that you have a creepy creative mind and I just love it a lot. “EEK” The one I like the most was the skeletons climbing up on the side of your house. Now that was creepy and creative. And I also like how you made spider with just 3 pumpkins and stick for leg. I would like to Thank you for a great laugh and I also enjoy them, too. I hope you have a great day. ? ? ?. ? Loves the climbing skeletons so much. Going to steal this idea for our house. That pumpkin spider is the cutest! Thanks so much for sharing these!